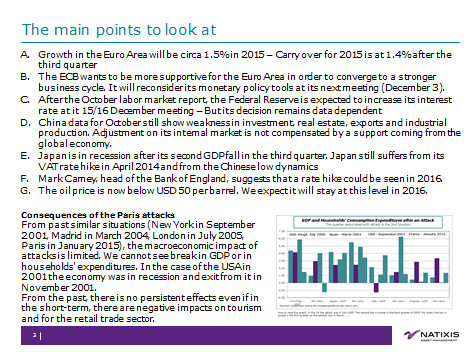 What macroeconomic dynamics after the attacks in France? Will the recovery of the French economy be undermined by the murderous attacks in Paris on November 13? Beyond the dramatic aspects and explanations that are not directly our responsibility, it is the question we must ask. For the French economy this negative shock arrives while it is emerging from a long period of very low growth. In recent months, elements for a more sustainable and favourable trajectory were progressively put in place. The attack could challenge this change in trend. The risk would be to see the economy converging to a slow growth profile that couldn’t generate net jobs creation. Spontaneously the immediate answer to the question suggests a “wait and see” behavior. The uncertainty engendered by a series of attacks creates a significant blur on the future situation. From the consumer side, additional uncertainty could be perceived through an expected fragility on the labor market. In this case, it would be rational for him to reduce his consumption and save more today to face a weaker situation in the future. As for companies we can imagine that the uncertainty caused by the terrorist attacks could lead to more cautious behavior especially in investment decisions. This would be very damaging because the economic cycle is built over time around the investment. Therefore one could imagine a negative impact on the activity with an increased risk of recession. US Job Market in October: A catch up or a change in trend? The number of new jobs, 271 000, is strong in October. In absolute terms this is remarkable. The question we must ask is the following: is it a change in trend or just a catch up after two mediocre months? If this is a change in trend with a November figure consistent with that of October then this increase, for sure, the likelihood of Fed rate hike in December. This is the reasoning that one often reads, at least implicitly, this afternoon. If it’s just a catch then the question of a change of Fed’s strategy remains. 13 points this week to follow the macroeconomic momentum. 1 – The Fed is back in the game after its last week meeting (27/28 October). It hasn’t changed the stance of its monetary policy but it has deeply changed its press release. Headwinds coming from the external environment of the US economy were the main point to notice in September. The message from the Fed was that the probability of a Fed’s lift-off this year was low. This point has been erased in the October’s press release. Moreover, the Fed has mentioned explicitly a potential change at its next meeting (15/16 December). Can we expect a lift-off in December? I don’t think so. The main reason for a change would come from the US central bank commitment to hike its interest rates in 2015. But as always the decision will be data dependent. The current economic situation will not create tensions that could push the Fed to change its strategy very rapidly. Recent data on the ISM and on retail sales have shown weakness that cannot be a support for a change.